Ming used counters to represent (-8) - (+5). Which of the following statements best describes how Ming used counters to model the problem? She subtracted red counters from the blue counters. She added red counters to the blue counters and then subtracted them. 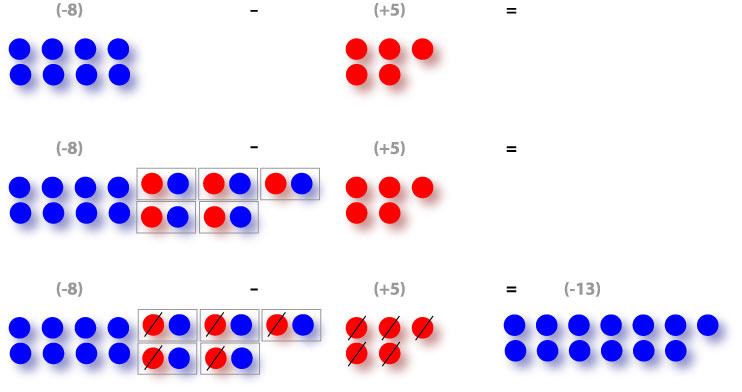 She added pairs of red and blue counters (which are equal to 0) to the blue counters. Then she subtracted the red counters. Calculate the difference using a counter model. A golf tournament lasted 2 days. The players scores for each day are shown in the table. Find the change in scores from day 1 to day 2 for each player. What was the change in Sams score? What was the change in Miguels score? What was the change in Vijays score? What was the change in Daviss score? What was the change in Tigers score? What was the change in Mikes score?